CONTACT: In Nevada: Dave Schwartz, campaign manager, Nevadans for Sensible Marijuana Laws (702-727-1081 or [email protected]). In Washington: Steve Fox, director of state campaigns, Marijuana Policy Project (202-905-2042 or [email protected]). LAS VEGAS, NEVADA — Tomorrow, at Caesar’s Palace, former Alaska governor Sarah Palin will deliver the keynote address at the Wine & Spirits Wholesalers of America’s national convention. Immediately following that speech, Dave Schwartz, the campaign manager for Nevadans for Sensible Marijuana Laws (NSML), will offer Palin $25,000 to deliver a similar address to supporters of a regulated marijuana market in this country. In exchange for the $25,000, Palin will be asked to speak at one of NSML’s upcoming events, acknowledge the fact that marijuana is just as legitimate a recreational substance as the substance she is talking about at the WSWA convention (in fact, it is objectively much safer), and endorse taxing and regulating marijuana in Nevada and throughout the U.S.
“There’s no reason why former governor Palin should reject our offer,” Schwartz said. “The health effects of the substance she is talking about at the WSWA convention cause 33,000 deaths in the U.S. annually. The comparable number for marijuana is zero. Alcohol is also associated with violent crime and other destructive acts, while marijuana is not. If Gov. Palin is comfortable endorsing that product, we are certain she will endorse ours. We look forward to negotiating with her team to find a time that works in her schedule. Nevadans for Sensible Marijuana Laws is a ballot advocacy group formed in Nevada to support a 2012 ballot initiative to tax and regulate marijuana like alcohol in the state. It receives significant funding and support from the Marijuana Policy Project. Since 1992, MTV has produced and aired programs like "The Real World," which feature young people consuming large quantities of alcohol and then engaging in reckless, violent, destructive, and oftentimes illegal behavior. Yet it has never once shown a cast member consuming marijuana, which the network almost surely prohibits and undoubtedly discourages. Please visit http://tinyurl.com/y8elkmn and take just a few seconds to sign SAFER's on-line petition calling on MTV to stop driving its cast members to drink and "start getting real." In the real world, millions of people use marijuana and every objective study on it has concluded it is far safer than alcohol for them and society. Yet in "The Real World" and other reality shows like "Jersey Shore," MTV makes sure alcohol is always available in abundance -- and that cast members never make the safer choice to use marijuana instead. Recently, things have gotten more out of control than ever. On this week's episode of "The Real World," an extremely drunken cast member shoved another off the tall ledge of the staircase outside their house, resulting in him being taken away on a backboard by paramedics. And just a couple a months ago MTV's new reality show, "Jersey Shore," received worldwide attention when a drunken young man at a bar punched one of the female cast members hard in the face after she accused him of stealing some drinks purchased by a fellow castmate. * You can help us draw much-needed attention to MTV's dangerous "alcohol only" reality programming by visiting http://tinyurl.com/ y8elkmn today and taking just a few seconds to sign: --- A petition in support of SAFER MTV programming --- Future cast members of "The Real World," "Jersey Shore," and other MTV reality shows should be allowed to use marijuana as a safer recreational alternative to alcohol. In the real world, millions of adults enjoy using marijuana responsibly, and every objective study on it has concluded it is far safer than alcohol both for them and society. Yet MTV embraces -- and often encourages -- the use of alcohol by its cast members, and it prohibits them from making the rational choice to use a less harmful substance instead. "The Real World," "Jersey Shore," and MTV's other reality shows should stop driving cast members to drink and "start getting real." MPP of Nevada Asks Law Enforcement: How Does Steering Adults Toward Alcohol Make Us Safer? This event coincides with the release of the most exhaustive collection of data ever on U.S. marijuana arrests, penalties and related information. Assembled by Professor Jon Gettman at Shenandoah University in Virginia, the new report finds that marijuana arrests in Nevada increased from 4,504 in 2003 to 7,950 in 2007. The arrest rate for possession per 100,000 residents in Nevada increased 57.9% over that time period, compared to just 12.7% in the U.S. While Nevada law enforcement was using its power to punish and intimidate marijuana users, binge drinking rates in the state rose 16% in those four years, but just 1.8% nationally. When: Thursday, November 5, at 11:00 a.m.
MPP of Nevada is a non-profit organization dedicated to educating Nevadans about the true nature of marijuana and about the harms caused by marijuana prohibition in the state. For more information about MPP of Nevada, please visit http://www.mppnv.org. One week ago today, Office of National Drug Control Policy Director Gil Kerlikowske (aka the Drug Czar) issued a statement declaring the issue of marijuana legalization a "non-starter" not even worthy of discussion in the Obama Administration. The Drug Czar's statement also highlighted the extraordinary social and health care costs associated with widespread alcohol use, suggesting that similar problems would occur if marijuana were to be regulated and treated like alcohol. Yet every objective study on marijuana has concluded that it is far less harmful than alcohol both for the user and for society. In response to the Drug Czar's statement, SAFER has launched an on-line petition, calling on the drug czar to either start basing our nation's drug policies on reason and evidence instead of mythology and ideology, or start explaining why he'd prefer adults use alcohol instead of a far safer substance -- marijuana. Please visit http://tinyurl.com/yj32wxb or click on the button to the right to sign the petition today. Then forward word of it to anyone who might be interested in siging on before we present it to the drug czar. Marijuana legalization, for any purpose, remains a non-starter in the Obama Administration. It is not something that the President and I discuss; it isn't even on the agenda. As the individual most directly responsible for marijuana policy in this country, this seems utterly irresponsible. Worse, your decision does not appear to be based on reason or evidence. Let's begin with one glaringly obvious omission in your statement. You failed to cite a single societal or health-related harm caused by the use of marijuana. Not one! Instead, you offered up some weak guilt-by-association scare tactics. To test the idea of legalizing and taxing marijuana, we only need to look at already legal drugs -- alcohol and tobacco. We know that the taxes collected on these substances pale in comparison to the social and health care costs related to their widespread use. Apparently, you believe that marijuana users should be punished and perhaps even jailed because alcohol, tobacco and pharmaceutical drugs are so harmful to users and society. Sorry, Mr. Kerlikowske, but that just doesn't cut it. If you are going to remain closed-minded in your approach to marijuana, you are going to need to step it up. Unfortunately, you know as well as we do that you don't have a whole lot going for you, which explains your flaccid, evidence-free statement. John Walters, feeding you the same old lines.) But what makes your position on marijuana legalization even more shameful is your background as a law enforcement officer on the streets. You know -- and maybe at some point during your tenure you will have the guts to admit -- that alcohol is really the drug in our society that causes the greatest amount of harm. This isn't an attempt to demonize alcohol, mind you; it's simply based on alcohol's close association with serious health problems and violent crime, as documented by scientific research and government statistics. The use of marijuana, on the other hand, does not have serious health consequences and is not associated with violent behavior. Again, you know this from your time on the streets. If you've forgotten, just recall the alcohol-fueled Seattle Mardi Gras riot that occurred on your watch. Or ask you're predecessor, Gen. Barry McCaffrey, who called alcohol "the most dangerous drug in America today," during a 1999 ONDCP press conference. So just why is it that you want to punish people who use marijuana, when you know the likely result is that many of these people will simply turn to using alcohol instead? Ya know, because it's "legal." We don't want to hear that alcohol does not fall under the mission of ONDCP. You, sir, raised the subject by asserting -- contrary to everything known about the two substances -- that we should look at our experience with alcohol if we want to get a sense of the potential social and health care costs associated with more widespread marijuana use. Moreover, given that the two substances are so popular in our society, you simply cannot discuss the prohibition of marijuana without considering its impact on alcohol usage rates. You hold a great deal of power in your hands. You can help determine whether we continue to steer adults toward using alcohol -- which you know produces serious societal harms -- or whether we instead allow them to make the rational choice to use a safer substance: marijuana. Come on. Show us that it is possible to be the drug czar and be thoughtful, open-minded, and accepting of scientific evidence at the same time. Or, at the very least, why don't you find some actual statistics to back up your bluster? In an historic hearing Wednesday, the California legislature examined the pros and cons of marijuana legalization. The hearing marked the first time legalization has been discussed in the legislature since California banned marijuana in 1913. Onlookers and media packed the hearing room for the three-hour session. 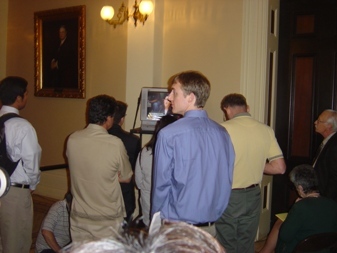 Capitol employees had to hook up remote monitors in the hallway for the overflowing crowd of supporters and opponents of marijuana legalization. The hearing before the legislature's Public Safety Committee was called for and chaired by Assemblyman Tom Ammiano (D-SF), who earlier this year introduced AB 390, a bill that would legalize, regulate, and tax marijuana in the state. While Ammiano has made clear that he supports legalization, the witness list for the hearing was well-balanced, with legislative analysts and representatives of law enforcement as well as reform advocates in the mix. The hearing began with testimony from legislative analysts, who estimated that the state could realize tax revenues ranging from hundreds of millions to nearly $1.4 billion a year from legalization. The latter figure was from the state Board of Equalization, while the lower estimates came from the Legislative Analyst's Office. But tax revenues wouldn't be the only fiscal impact of legalization. "If California were to legalize, we would no longer have offenders in state prison or on parole for marijuana offenses," noted Golaszewski. "We estimate the savings there at several tens of millions of dollars a year. There would also be a substantial reduction in the number of arrests and criminal cases law enforcement makes. To the extent they no longer have to arrest people for marijuana, they could shift resources elsewhere." Golaszewski said there are roughly 1,500 people imprisoned on marijuana charges in California, 850 of them for possession offenses. The analysts were followed by a panel of attorneys who debated the legality of state legalization. "If California decides to legalize, nothing in the Constitution stands in its way," said Tamar Todd, a staff attorney for the Drug Policy Alliance Network. But while Marty Mayer, attorney for the California Peace Officers Association (CPOA), generally agreed with that assessment, he also argued that the state could not unilaterally legalize. "The state of California cannot unequivocally legalize marijuana," he said, noting that marijuana is prohibited under federal law. Next up were the cops, and there were no surprises there. "Marijuana radically diminishes our society," said CPOA president John Standish. "Marijuana is a mind-altering addictive drug that robs you of memory, motivation, and concentration," he said before Ammiano cut him short, noting that the purpose of the hearing was to discuss public safety and economic impacts of legalization, not to debate marijuana's effects on health. "Alcohol and cigarettes are taxed to the hilt, but the taxes don't cover the cost of medical treatment, let alone DUIs," Standish continued. "This would lead to an increase in crime rates, social costs, medical costs, and environmental concerns. There is also a very real concern that Mexican drug cartels are behind most of the imported marijuana coming into the US," he added, without explaining what that had to do with legalizing marijuana production in California. And, pulling out yet another woolly chestnut, Standish resorted to the old and discredited "gateway theory" that marijuana use is a stepping stone to hard drug use. "Marijuana is a gateway drug," he said. "Every incident in 30 years of law enforcement I have been in where marijuana has been involved has not been good. Both marijuana and methamphetamine are equally critical problems," he said. After reciting a short list of violent incidents around large-scale illegal grows allegedly operated by Mexican drug cartels, Sara Simpson, acting assisting chief of the Attorney General's Bureau of Narcotics Enforcement, warned that the cartels were likely to try to maintain their market share. "That could lead to more violence," she warned. "Legalizing marijuana is bad public policy," said Simpson. "A significant number of marijuana users are incapacitated," she claimed. "When a recreational drug user backs over your four-year-old, you consider yourself a victim of violent crime. Legalization would increase death and injury totals." "Why would we want to legalize a substance known to cause cancer?" asked Scott Kirkland, chief of police in El Cerrito and chairman of the California Police Chiefs' Medical Marijuana Task Force. "Legalization will only result in increased use of marijuana with a corresponding increase in drugged driving," he warned. But later witnesses said that California was simply wasting resources by arresting marijuana offenders. Dan Macallair, executive director of the Center on Juvenile and Criminal Justice, said that arrest statistics from the past 20 years show that California law enforcement is more focused on prosecuting simple possession cases than cultivation and sales. "California's drug war, particularly on marijuana, is focused on drug users," he said. "Virtually every category of crime has declined since 1990, except for a dramatic increase in arrests for marijuana possession. In 1990, there were 20,834 arrests for possession. Last year, there were 61,388 arrests. " This was going on while arrests for all other drug offenses declined, Macallair said. For all other drugs, arrests were down 29%. Even marijuana manufacture and sales arrests had declined by 21%. More people went to prison in California in 2008 for marijuana possession than for manufacture or sales, he added. "Our courtrooms are full every day with marijuana cases," said Terence Hallinan, the former San Francisco City and County District Attorney. "It's still against the law to sell even a gram. There are a lot of people in court and jail for marijuana offenses." The Rev. Canon Mary Moreno Richardson of St. Paul's Episcopal Cathedral in San Diego told the committee marijuana law enforcement has especially pernicious effects on the young. "When they find a group of kids with a joint, they take them all in to juvie. When they're incarcerated, they join gangs for safety. Jails have become the boot camps for the gangs," she said. "We need to think about and protect our youth." "I speak on behalf of California's millions of marijuana users who are tired of being criminals and would like to be taxpaying, law-abiding citizens," said Dale Gieringer, executive director of California NORML. "We think it makes no sense for taxpayers to pay for criminalizing marijuana users and their suppliers when we could be raising revenues in a legal market." "Today, our marijuana laws are putting our children in harm's way," said retired Orange County Superior Court Judge James P. Gray. "We want to reduce the exposure of a lifestyle of marijuana use and selling to our children, but prohibition's illegal dealers don't ask for ID," he said. At the end of the hearing, Ammiano opened the floor to public comment. While most speakers supported legalization, a contingent of conservative African-American religious leaders vigorously denounced it. "I know from personal experience the devastation that occurs in one's life and community as a result of drug abuse that began with marijuana," said Bishop Ron Allen, founder and president of the International Faith Based Coalition. 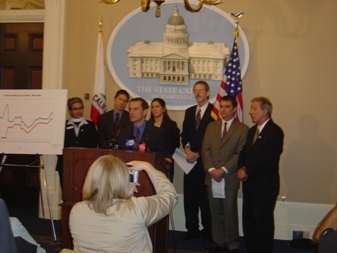 Also in opposition was Californians for Drug Free Youth. John Redman, the group's director, said legalizing marijuana to raise revenues was reprehensible. "This is blood money, pure and simple," Redman said. The battle lines are shaping up. On one side are law enforcement, conservative clerics, and anti-drug zealots. On the other are researchers, activists, and, evidently, the majority of Californians. Ammiano gave as a handout at the hearing a sheet listing at least six recent polls showing majority support for marijuana legalization in the state. The bill isn't going anywhere for awhile. Ammiano said he will hold more hearings later and may revise it based on the hearings. But marijuana legalization is now before the legislature in California. LAS VEGAS -- At a Las Vegas news conference Sept. 23, the Marijuana Policy Project of Nevada will announce details of a $10,000 challenge to the people of Nevada. MPP-NV will pay $10,000 to anyone who can disprove three statements of fact that demonstrate that marijuana is objectively and unquestionably safer than alcohol. MPP-NV manager Dave Schwartz will unveil a large mock check for $10,000 as he announces specifics of the challenge, which kicks off a long-term public education campaign regarding the relative harms of marijuana and alcohol, and the harm caused by marijuana prohibition. WHEN: Wednesday, Sept. 23, 11:00 a.m.
WHERE: Near the emergency room entrance of University Medical Center Hospital (behind the hospital), corner of Goldring Avenue and Rose Street, Las Vegas. MPP of Nevada is a nonprofit organization dedicated to educating Nevadans about the true nature of marijuana and about the harms caused by marijuana prohibition in the state. For more information about MPP of Nevada, please visit http://www.mppnv.org. In the past few years, Colorado-based activist Mason Tvert has taken the notion of comparing marijuana to alcohol and used it to great success, first in organizing college students around equalizing campus penalties for marijuana and underage drinking infractions (marijuana offenses are typically punished more severely), then in running a successful legalization initiative in Denver in 2005. Tvert and his organization, SAFER (Safer Alternatives for Enjoyable Recreation), continue to hammer away at marijuana prohibition, and now, in collaboration with NORML analyst Paul Armentano and MPP director for state campaigns Steve Fox, he has taken his "marijuana is safer" campaign to a new level -- and, hopefully, to a new and broader audience. Having known (and repeatedly interviewed) all three coauthors in the course of my duties for the Drug War Chronicle, I assumed "Marijuana Is Safer" would be a good book. I was mistaken. It's a great book, and an extremely useful one. "Marijuana Is Safer" starts out hitting on all eight cylinders with a foreword from former Seattle police chief Norm Stamper and never lets up. It hits its points concisely and engagingly, it is thoroughly researched, and its political arguments are carefully thought out. Regular readers of the Chronicle may not expect to learn a lot that they didn't know already, but they will likely be surprised, especially when it comes to the deleterious effects of alcohol. Did you know about the nasty effects of acetaldehyde? I didn't. It's what you get when you metabolize ethanol (alcohol), and it's carcinogenic and damages internal organs. Because it is so damaging, the body breaks it down into acetate, but if you're drinking at the rate of more than a drink an hour, you're body starts lagging behind. Something to keep in mind the next time someone invites you to join a drinking contest. Similarly, you may share the general conviction that alcohol use can lead to violence, disease, crime, and accidents, but "Marijuana Is Safer" offers up the hard numbers -- complete with footnotes. Here's just one hard number: 35,000. That's the number of deaths each year attributed to chronic alcohol consumption. We all know what the number of deaths attributed to chronic use of the chronic is, don't we? That's right, zero. Armentano, Fox and Tvert offer a mix of history, science, medicine, media critique, and just plain straight talk as they survey the history of alcohol and marijuana use in America, discuss the differing attitudes toward the two drugs, explain the rise of marijuana prohibition, and, most centrally, compare and contrast the effects of the two drugs on individual consumers and society as a whole. They also dissect the arguments that legalizers have used -- so far, unsuccessfully -- to try to end marijuana prohibition. While those arguments are perfectly valid, the coauthors argue that they cannot counter the objection of people who might otherwise be persuaded: Why should we legalize another vice? Naturally enough, Armentano, Fox and Tvert have the answer: "We would not be adding a vice; we would be allowing adults the option to choose a less harmful alternative for relaxation and recreation," they write. They also provide the "money quotes" for several other skeptical responses to a legalization pitch, all designed to highlight the comparison of alcohol and marijuana. And these three are extremely well-positioned to know what to say; all three have been engaging in this conversation for years. The coauthors also make a compelling argument that the "marijuana is safer" approach is a winner precisely because it forces listeners to think about alcohol and what it does -- something that all Americans know quite a bit about even if they don't drink. The comparison of marijuana and alcohol brings the discussion down from lofty abstractions about freedom and liberty to real world experiences with America's most popular drugs. The "marijuana is safer" approach works just fine for marijuana, but potentially subverts broader anti-prohibitionist politics. It is difficult to imagine an argument for drug legalization based on "methamphetamine is safer" or "heroin is safer." It also effectively throws up a wall between "soft" marijuana and "hard" other drugs, abandoning broader drug legalization for freeing the weed alone. But perhaps "abandoning" is the wrong word. After all, Armentano and Fox work for marijuana reform organizations -- not drug reform organizations -- and Tvert's work all along has been about marijuana. But possible unhelpful side-effects for broader anti-prohibitionism aside, "Marijuana Is Safer" is extremely worthwhile. This is a book you can hand to your mother or your teacher or your preacher and provide him or her with a nice framework for looking at marijuana -- one that by its inexorable comparative logic leads to the inescapable conclusion that marijuana should be legalized. And for those readers with an interest in activism, this book needs to be on your bookshelf. It's full of handy, well-documented facts, it's got the answers to the questions you're likely to hear, and it's even got a how-to activism section at the back. I guarantee that if you own this book, it's going to be very well-thumbed before very long. SAFER is hosting a party to celebrate the launch of Marijuana Is Safer. The event will include appetizers and an auction, and all proceeds from book sales will benefit SAFER. Copies of the book will be available for just $20 -- or for $30, get a copy and have one sent to a Colorado legislator! -- and SAFER's Mason Tvert will be on hand to discuss the book and sign copies. 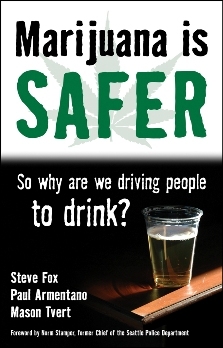 The highly acclaimed book co-authored by SAFER's Mason Tvert, Marijuana Is Safer: So Why Are We Driving People to Drink?, is now available. A book about marijuana has never hit #1 on Amazon.com, but with your help that could change. Please join hundreds of other marijuana reform supporters in purchasing the book via Amazon on Thursday, August 20. Amazon re-ranks book sales on an hourly basis, so Marijuana is Safer doesn't need to be the bestselling book for the past month; it just needs to generate a lot of sales on the day of the Book Bomb. If everyone acts, it will reach the top. For more information visit http://www.MarijuanaBookBomb.com.